Monrovia Fashion Week is back this year for 2015 edition of the event. Are you are a talented model and you want opportunity to be part of this year's event? Model casting has been scheduled Saturday, August 29, 2015 at Lila Brown Restaurant on UN Drive. The organizers of Monrovia Fashion Week is currently looking for applications from established or new models for a variety of activities. Runway models to engage the performances, editorial and commercial models to grace the MFW promotions and magazine features in addition to a very special competition, ´Face of Monrovia Fashion Week.´ This event will allow the chosen winners (one male and one female) to feature on the first magazine cover, along with a feature fashion editorial spread. The dynamic young female and male model will embody the energy, diversity and branding of MFW through their image, attitude and personality. ‘The invitation for applications by e-mail is currently open for models residing out of Liberia. We also will accept models that are non-Liberia. The main casting event will give the candidates an opportunity to apply for all classifications, as well as interviews from the MFW team, opportunities to present their portfolios (both on-line and off-line) concluding in a general question and answer session with other candidates. The purpose for MFW is to discover, showcase and inspire fashion talent in and from Liberia, as well as from the rest of the world. Africa is a continent with unique fashion inspirations and design aesthetics which we desire to showcase to the world. We want to be able to pull out all African and Liberian-inspired fashion designers, merge them with other designers so that Europeans and the world alike can see the richness that is embedded within us as a people. By doing this it will encourage local commerce of the designer's products. As we create a movement to help develop fashion in Africa, we will in turn create thousands of jobs in the widely branched fashion industry. And in doing so, support the fight against poverty in Liberia. MFW would like to expand the Liberian fashion and textile industry through mentoring, exhibiting and promoting home based and international African and African-inspired designers. The ultimate vision is the empowerment of Liberian designers, highlighting their contributions to the industry and branding African countries as global players in fashion, art and culture. 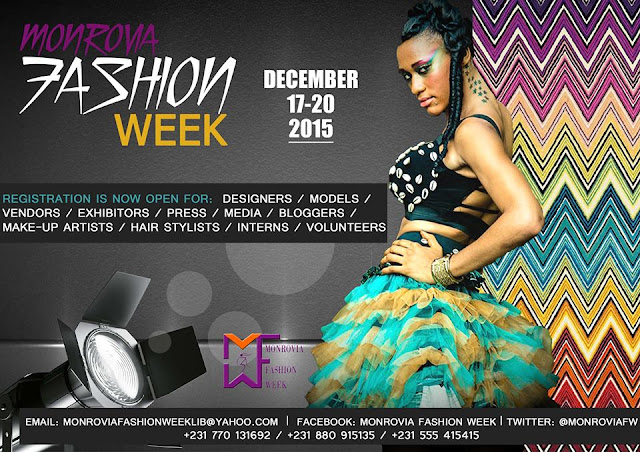 Monrovia Fashion Week will be from December 17 – 20, 2015, and it will present the latest collections to the fashion press; fashion journalists, photographers, stylists, retail buyers and the fashion audience. Monrovia Fashion week is not only a business event but is also an artistic, social and cultural gathering. Fashion is a constantly moving art form. Following and recognizing this movement is what the Fashion industry is about. Designers put creativity and innovation into their designs to tell their artistic story to the audience and the fashion industry. *Do you have a company and looking for marketing? Contact us for sponsorship opportunities today!